“Peter takes away all our money,” say farmers in Bihar, bristling with anger. They want to get rid of Peter but can’t. Peter is the diesel pump used widely in the state for irrigation due to power shortage. The three horse power (HP) pump consumes a litre of diesel (Rs 50) in an hour. Last year, the state government initiated a pilot offering an economical and sustainable alternative for free—solar-powered pumps. But its faulty implementation has marred hopes of eliminating noisy Peter. Under the pilot, Bihar’s minor irrigation department, along with Delhi-based Claro Energy Pvt Ltd, has fitted 34 community tubewell pumps with solar panels in Nalanda district. As per the agreement, Claro maintains the pumps while the department looks after the underground water channel. A solar community pump (7.5 HP) caters to 20 to 30 fields. By shifting to the solar pump from Peter, many residents of Gonkura village saved about Rs 50,000 last year. But the happiness was short-lived. Over the past five months, only few fields in Gonkura are receiving water. “PVC pipes that run from the pump through the fields have holes. Consequently, some fields get overflooded while some get less water,” says the pump caretaker. He cycled 13 km twenty times to lodge a complaint with the minor irrigation department, but to no avail. Another problem is that some pipes do not reach the farmers. They run for 200 metres, while many fields are farther away. “This rabi season we may have to supplement irrigation with Peter,” rues a resident demanding quick repair and extension of pipes. Farmers, meanwhile, point out that the pump had reduced their input cost considerably. “We have to pay only Rs 5 per kattha (1.33 hectares), per irrigation cycle to water fields,” says a resident of Gonkura. An unsubsidised 3 HP solar pump (worth Rs 4.5 lakh) has negligible recurring cost, while a diesel pump (Rs 70,000), assuming it runs five hours a day, has an annual recurring cost of Rs 80,000. The cost of the solar pump can be recovered in four years, while for diesel the spending never ends. On the one hand, the state is promoting clean energy and on the other, it is giving 30 per cent subsidy on diesel. This may prevent people from buying solar pumps in the future. Diesel cannot be done away with immediately, says a state government official requesting anonymity. “The disbursement of the subsidy has been patchy. As a result, farmers are buying diesel at market price,” points out Kishore. Despite water scarcity, Rajasthan is actively pushing for solar pumps. Its horticulture department provides 86 per cent subsidy on pumps, while the rest is borne by the farmer. Till date the department has installed 1,725 pumps, and plans 3,000 more this year. There are certain conditions for selecting the beneficiary: those who practise horticulture on a minimum of 0.5 hectare (ha), have tubewells or farm ponds (diggis) to store rain or canal water, and drip irrigation system. “These conditions may limit the use of pumps,” believes Nidhi Tewari, policy researcher with International Water Management Institute (IWMI). Less than 10 per cent of farmers in Rajasthan practise horticulture and fewer have the drip. “Many farmers are not even aware of solar pumps and government makes no effort to reach them,” says Ajay Jakhar, president of Bharat Krishak Samaj. Kishan Das of 15 Z village in Sri Ganganagar is one of them. He grows mustard and wheat on his small farm. “For irrigation I use water from the Indira Gandhi Canal, but the supply is decreasing. Earlier, water was released weekly, but now it is done fortnightly,” says Das who neither has a diggi nor the drip system. 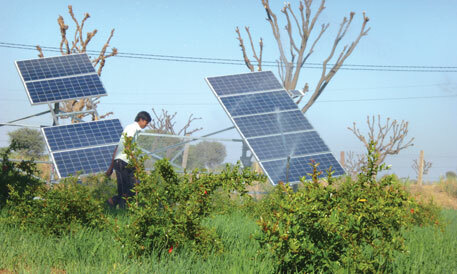 According to the horticulture department, the solar pump is meant “only for progressive farming and promotion of cash crops and water saving.” Rajendra Singh Khichar, agriculture research officer at the Directorate of Horticulture in Rajasthan, says, “What is wrong if solar pumps encourage farmers to invest in drip irrigation and diggi?” The state in addition provides 90 per cent subsidy on drip irrigation and 50 per cent on diggis. Kishore contends that linking drip irrigation system with solar pump may not ensure its use. “Many farmers buy the drip to get the pumps but do not use it. They use the pump for running sprinklers which is a less water-efficient technique.” In some areas where water table is low, farmers use high-capacity motors. “Solar pumps should not be promoted in such areas because when farmers get free energy, they over exploit groundwater,” says Kishore. “Irregular power and high diesel cost actually deter exploitation of groundwater in these areas,” he adds. Besides water availability, the demand for solar pumps is also guided by cropping seasons. In states like Uttar Pradesh, Bihar and Madhya Pradesh, where 80 per cent of energy demand is in winters, the use of solar pumps will remain restricted due to cloud cover or fog, points out Jakhar. “Solar has its limitations, but low water discharge is sufficient during winters as requirement is less,” says Wahi of Claro. In such a situation, diesel could be used to supplement irrigation, adds Kishore. It is due to such reasons many entrepreneurs are exploring other financing models. Claro is in talks with NABARD to work out a financing mechanism. The banking sector, however, is reluctant because of lack of experience in the field. “Some past experiments with renewables have failed because of high default rate. This affects the bank’s portfolio,” says an official of a rural bank requesting anonymity. Farmers say defaults happen because their income is seasonal and insufficient. “Solar pumps have an advantage. Their use is linked to increase in farm income which will help people pay installments. Banks need to show confidence for such projects to take off,” says Wahi. In April last year, Bihar’s minor irrigation department rejected NABARD’s proposal of connecting tubewells with solar, saying the technology is costly. Lack of economic options for farmers is fuelling the growth of new players that provide solar pumps at low costs. Take for instance Navneet Sharma in Rajasthan’s Bikaner district. He sells a 3 HP pump at Rs 1.60 lakh which includes the cost of four batteries for power backup, something the state government-empanelled companies do not cover. Seeing such low cost options, a farmer in Sri Ganganagar has filed a public-interest petition in the Rajasthan High Court against the empanelled companies for selling expensive pumps. Sharma has till now installed 30 pumps. While farmers using his pumps have reported no problems, some companies have raised questions regarding product quality. Sharma says, “We cannot afford to supply substandard material because we operate in a local market. We procure material from the place others do. It is just that we bargain, ensure timely payment and do not have incremental costs of standardisation.” Like empanelled companies, Sharma also gives 25 years of warranty. He asks, “What is the guarantee of the quality of solar equipment supplied by the empanelled companies?” An empanelled company has to send its products for testing to the lab of the Ministry of New and Renewable Energy. “These companies send the best product to get the approval. What is actually installed could be substandard,” says Krishna Bhambhoo, a dealer of Waaree, a solar panel manufacturer, in Rajasthan. “There are no local testing facilities. The verifying team generally sees if the pump is running,” says Tewari of IWMI. Khichar, however, defends that quality cannot be compromised as there are quality inspections before the despatch and installation of the material. It is often argued that solar pumps may find it difficult to gain ground in areas where subsidised electricity is in good supply. But experts say this is a rarity in most parts of the country. They advocate use of solar pumps although they are expensive because the installation cost of the grid is high. 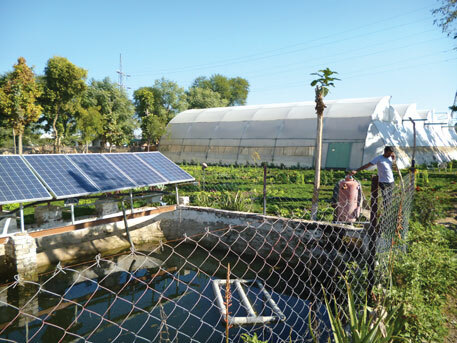 According to the Rajasthan horticulture department, an investment of Rs 700 crore in solar pumps can save installation cost of 70,000 farm connections. And farmers can recover the cost of the pump within a year or so. A major reason behind the promotion of solar pumps is poor financial health of state discoms and a long pending list of farm connections. “The hours of power supply are also limited,” says Tewari. In Bihar, however, use of solar pumps may face competition from electric pumps. Last year, the state announced the Bihar Agriculture Road Map under which a separate 1,500 MW power grid will be set up exclusively for agriculture. This makes the state’s stand on clean energy confusing. To make solar pumps successful in agriculture, the government needs to clearly define policies, says Kishore. The solar water pumping system uses solar energy to pump water. The system operates on power generated using solar PV (photovoltaic) system. The photovoltaic array converts the solar energy into electricity, which is used for running the motor pump set. The pumping system draws water from the open well, bore well, stream, pond, canal etc. A system with 1800 watt PV array capacity and 2 HP pump can give a water discharge of 1.4 lakh litres per day from a depth of 6 to 7 meters. This quantity of water is considered adequate for irrigating about 5-8 acres of land holding for several crops. The 3HP solar power surface pump would cost Rs 4.25 lakh while the 3HP submersible solar pump with a maximum 75-metre head would cost around Rs 4.85 lakh. " Earlier the same pump cost around Rs 5.70 lakh. However, prices have come down due to competition. Under the scheme farmers will get 86% subsidy on the cost of the pump, only having to pay the remaining 14%. Solar pumps sets are attached to the water source. The pump's solar panel converts the solar energy into electrical power, which runs the motor to pump water. Apart from small and Medium Farmers constraints even to meet the money after Government subsidy, the main drawback is reliability of the Solar Pumps. Solar Pumps work efficiently in the case of Open Wells. India has about 15 million grid-powered pump-sets and close to 7 million diesel-powered pumps. However, only about 7500 solar pumping systems have been installed for agricultural use in India. Ã”Ã‡Ã³	It is proving increasingly difficult for the government to continue subsidizing the rising costs of generation, transmission and distribution losses, pilferage, etc (to deliver 3600 kWh to a farmer to pump water, 7000 kWh is required to be generated, assuming a diversity factor 2). The loss of revenue to the government is colossal. Ã”Ã‡Ã³	Grid power is unreliable and of poor quality, often leading to motor burnouts at the tail end. Ã”Ã‡Ã³	In a coal-fired thermal generating station, 1 kWh of electrical energy generated translates to 11.2 tonnes of carbon dioxide emission a year. The power tariff for Agriculture is free in some cases and minimal in other cases. Many of the Irrigation motors are outdated as such inefficient. A scheme can be chalked out by State Governments to replace the 4existing inefficient irrigation pump sets with modern ones by giving subsidy. This way enormous power can be saved. Electricity is a high grade energy which finds use in industry,lighting,computers etc. Solar systems are the great source of using one form of energy and converting it into another useful form. I would better love to use it for my home. Amazing post. Solar Powered Water Pump system to lift water from 650 feet deep from th ground level to about 50 feet above the ground level. Required two sets. Solar pumps were a success in Rajasthan because the pumped water is used for dry crops. Also big storage tanks were built to pump the water to the tanks first as Solar insolation is intermittent. "A Newspaper report(Andhra Jyothi, Nellore Edition) says: 450 Farmers will be provided with Solar pumps. A solar pump costs Rs 4.95 lakhs and beneficiary has to meet Rs 55000. 17 Industries are approached to meet under CSR fund Rs 2.5 crores so that the beneficiary gets the solar pump free." Though this sounds laudable, anything given free in India don't work. Under National Demonstration Scheme the then Department of Non-Conventional Energy(DNES and now MNRE installed about 4000 water pumping w2indmills free.in 80s. In Andhra Pradesh about 500 were installed. In our Fields Two were installed. These windmills were installed in RTC Bus stands, on the roadside etc. None of them worked and now ghosts. A good water pumping windmill costs about Rs 1 lakh and these windmills were manufactured in Polytechnics at a cost of Rs 20,000. In our fields they were blown away in a small gale. This is a classic example of indian mindset that anything given free, they never care to look after well. One more example. In the beginning simple box type solar cookers which used to cost Rs 650 were given a subsidy of Rs 150. Today there are 6 lakh Box Type solar cookers ever sold (but not all of them used). Why? There is no provision for frying in Box Type solar cooker, only boiling of rice, dhal etc. You can't have two cooking options one for boiling and another for frying. Moreover many don't like to cook in open. Assuming that educated women use it, the office going people will be away during sunshine. In Innovation theory there are two approaches: Technology Push and Demand Pull. Solar cookers belong to the former and mosquito mats/coils; mineral water etc. belongs to the latter. On the other hand there is bicycle which costs thrice that of a solar cooker and millions of them are in use and were never subsidised. In fact bicycle is the CLEANEST FORM OF TRANSPORTATION. Though the promoters of solar pumps claim that they work for 8 hours, maximum pumping of water occurs between 11am and 2 pm. rest of the time small quantities. Solar insolation being intermittent,the water has to be pumped to a storage tank which has to be built at a higher elevation for gravity flow otherwise another system to pump water to the fields. Solar pumps are not reliable source for paddy as it is water intensive. In Andhra Pradesh NEDCAP is not suggesting who will meet the cost of the storage tank which is substantial? On the other hand for Rs 5 lakhs one can replace the inefficient electric motors about 17 motors with efficient ones(@Rs 30,000). By selling the old motor one can get Rs 2000 to 3000 and the Farmer can meet about Rs 3000. There are 13 lakh Electric pumpsets in AP. A saving of about 30 % of power possible. Electricity is a high grade energy which one needs for Industry, lighting etc. In AP per electric pump set the Farmer pays Rs 30 per month which is meager. By replacing the entire electric pumpsets with efficient ones, the Government can save thousands of MW of power. Energy saving is cheaper than energy generation as for new thermal projects, one needs to get number of clearances which takes years. As one American Cynic put it," You Indians guys are better than Bill Gates in Creating Windows". The protogonists of Solar pump say that solar power is free. At What cost? At what reliability? They site the power cuts of grid electricity. This is absurd. Both Electricity(conventional) and Non conventional(Solar) arte financed by Government and how they can cite the former as unreliable. In the name of Solar power and subsidies huge public funds are wasted. We need to spend public money judiciously and not as vote catching.